Listen: Making Sense of Sound. Staff, artists, and other contributors. For decades, the Exploratorium has signaled closing time and marked significant events by ringing a large bell. Today, artist Brenda Hutchinson will present the museum with a new bell, which she personally delivered from across the country. Join us to welcome this resonant addition to our sonic environment with open arms and as many bells as we can ring. If a bell rings in a shopping mall parking lot, will anyone respond? 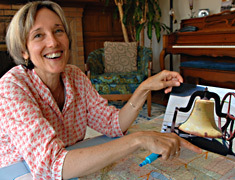 In September 2006, artist Brenda Hutchinson set out on a cross-country journey to investigate the public’s interactions with and reactions to the sonorous tones of a large cast-iron bell. From coast to coast, she rang the bell in small towns, city parks, rest stops, and more. In this special presentation, she’ll share stories about her adventure. To see photos of the trip, and to read Brenda’s blog, check out The Bell Project Web Site. Do you hear what the Physics of Toys team hears? To find out, stop by the Physics of Toys activity stations to make some listening toys from the “Secret Sounds” section of the Exploratorium's brand new publication, Exploratopia! Multiple Sidosis (1966, 9 min.) Written, directed and starring Sid Lavarents, this film utilizes quick cuts and multiple angles of a one-man-band musical performance. Kitchen (2005, 3 min.) by Noah Cunningham and Chih Cheng Peng transforms an ordinary kitchen into a massive percussive device. Order (1979 2 min.) by Kit Fitzgerald and John Sanborn depicts a series of gestures (hands clapping, phones ringing, glass breaking) and edits these everyday sounds into quick bursts of aural frenzy. Birdbeat (fugue) by Geoff Adams (2002, 5 min.) transforms the cacophony of birds at a backyard feeder into a jazzy animated composition. Blowing Things Away (2001, 3 min.) by Felipe Dulzaides is a physical study of focused breath and emanating sounds. 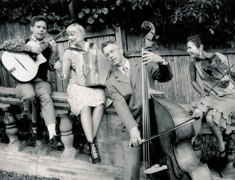 Help celebrate the opening of Listen with a festive performance by San Francisco’s Baguette Quartette, which plays music heard in Paris between 1920 and 1940 on street corners, in cafes, and in popular dance halls. Led by accordionist Odile Lavault, Baguette Quartette’s repertoire consists of valses musettes, tangos, pasos dobles, fox trots, marches and other chansons. The Dreamer That Remains: Harry Partch (1972, 30 min., 16mm film), directed by Stephen Poulliot and produced by Betty Freeman, captures the spirit, life, and recollections of composer Harry Partch. He reminisces on his hobo days, dotes over his unique, handmade instruments, and composes a beautiful score captured on film. This rarely-screened documentary provides glimpses into Partch’s interactions with the people and the world around him. Experiment with the interplay between touch, sound, and technology at Jeff Hoefs’ and Peter Chester’s Scala Media. Each of four wooden vessels holds a shallow pool of water. Touching the pools creates sound, which grows in richness and complexity as more people interact with the piece. This unique immersive installation lets visitors create and explore their own compelling sonic environments. Celebrated Bay Area music documentarian Les Blank brilliantly captures Lightnin’ Hopkins, the great Texas bluesman, in his namesake film, The Blues Accordin’ to Lightnin’ Hopkins (1969, 30 min., 16mm film). Blank reveals the musician’s inspiration and features a generous helping of classic blues. This powerful portrait includes performances at an outdoor barbeque and a rodeo, as well as a visit to Hopkins’ boyhood town of Centerville, Texas. The human vocal tract can make an amazing variety of sounds. If you can use your mouth to call a duck, imitate a jet engine, or make any other incredible audible, come showcase your talent at our first-ever Tournament of Noises. A panel of judges will evaluate the outbursts and award prizes for the funniest, loudest, longest, and most surprising sounds. Whether you're a contestant or an observer, this program will definitely open your ears! Breath Control: The History of the Human Beat Box (2002, 73 min) by Joey Garfield surveys the phenomena of beatboxing, an improvisational urban art form rooted in hip hop and African chanting. Pioneered in the 1980s by the likes of Doug E. Fresh and The Fat Boys, beatboxing stylizes the human voice as a polyrhythmic drum machine. The award-winning documentary features animations that explain the physics of beatboxing, as well as how-to lessons from rap luminaries Biz Markie and Professor X.
Kreise (1933, 3 min., 16mm film) by Oskar Fischinger reveals a modern Op art sensibility in its use of patterns and colors. The images work in perfect resonance with scores by Edvard Grieg and Richard Wagner. Tops (1969, 7 min.) by Charles and Ray Eames, is a classic toy film of pure cinematic poetry, features a lyrical score by Elmer Bernstein. Daybreak Express (1958, 5 mins.) by D.A. Pennebaker plays with tempo and reflection on a New York elevated train set to a Duke Ellington composition. Pacific 231 (1947, 9 min. ), filmed by Jean Mitry in collaboration with Arthur Honegger, is a cinematic poem in which train imagery and musical sounds are perfectly matched. This weekend, we’ll fill the museum with a cavalcade of musical delights, including live opera, a handbell performance from Ringmasters of the San Francisco Bay, the Ohlone Tuba Ensemble, and the Balkan Women’s Choir Born to Drone! Take flight on the vocal sonorities of True Harmonic Equation (T.H.E. ), the acapella troupe of the Oakland Youth Chorus. Hum along to contemporary African and Kwanzaa songs, as well as other holiday tunes steeped in a diversity of cultures and religions. Spirituals, as well as classical and pop music, round out the musical offerings of this young, auditioned singers ensemble. 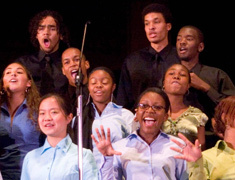 The Oakland Youth Chorus for Music Education provides cross-cultural musical training and performance programs for youth, fostering talent, confidence, and community. 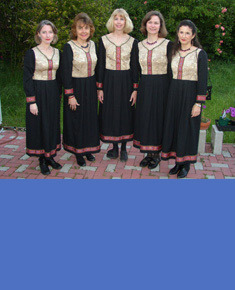 Born to Drone is a women's vocal ensemble specializing in folk music from the Balkan region and beyond. Their repertoire comes from ethnographic field recordings, professional recordings made by Eastern European folk artists and ensembles, as well as material presented at workshops and Balkan music camps in the United States. Most of their music is sung a cappella, while some pieces are accompanied by musicians playing traditional instruments. The drone in their name refers to a traditional Eastern European method of diaphonic singing, in which a lead singer sings the melody while the others sustain a single tone, or drone note, creating an effect much like that of a bagpipe. The Ringmasters of the San Francisco Bay is an internationally renowned group. 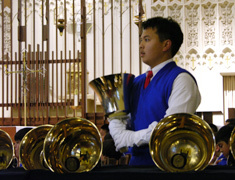 They perform local concerts and are the premier handbell group of the Golden Gate Boys Choir. The Ringmasters are most known for wowing their audiences with their delightful interpretations of upbeat classics such as "The Stars and Stripes Forever." Under the direction of maestro Steven Meyer, the group is composed of eleven young men ranging in age from middle school to high school students. In this group, these young men acquire the necessary skills in theory and musicianship to become successful performers. The Ohlone College Tuba Ensemble, under the baton of Tony Clements, is an ensemble comprised of instruments of the tuba family, including baritone, euphonium, bass and contra bass tubas. 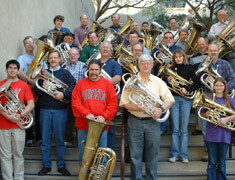 They perform selections from standard tuba ensemble repertoire and transcriptions from all styles of music. 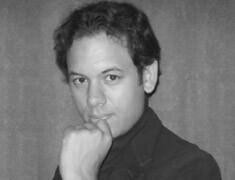 Members of the ensemble are often featured as soloists. Tune up your ear and get ready to experience the power and passion of live opera as tenor Will Hart Meyer and Mezzo-Soprano Kathleen Moss perform well known classics from contemporary and classic operas like Carmen, La Traviata and The Merry Widow. Melody of China (MOC), a non-profit Chinese music ensemble, will help you journey through the musical landscapes of China. Listen for the clomp and clatter of galloping hoofs in one of their Mongolian folk songs, called “The Horse Race.” The trio will perform from their repertoire of musical forms that combine the traditional and contemporary. 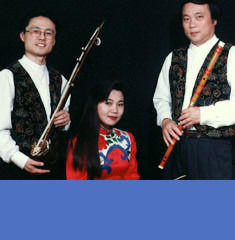 Hong Wang is a multi-instrumentalist, Yangqin Zhao specializes in the yangqin (hammered dulcimer) and Xian Lu's expertise is with the dizi (bamboo flute) and other wind instruments. The award-winning, Bay Area-based ensemble performs regularly throughout the United States, Europe, Asia and Australia. Melody of China’s extensive repertoire includes folk songs, opera, instrumentals, as well as classical, festival, and contemporary music. They also celebrate the musical heritage of Chinese ethnic minorities, concentrated in the far western and northern edges of the mainland. Presented in partnership with 23five Inc. This two-night special event presents live performances by eight contemporary sound artists. Working with field recordings in conjunction with minimalism, electro-acoustics, and film, these artists negotiate the shifting terrain between the natural and the artificial. Friday’s performers include Camilla Hannan, B.J. 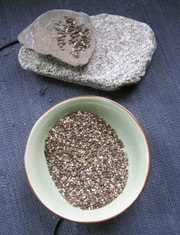 Nilsen (a.k.a. Hazard), Tarab, and Aaron Ximm. Saturday features Keith Evans, Matt Shoemaker, Olivia Block, and Steve Roden. The performances are free with same-day museum admission, but reservations are recommended; please call (415) 528-4308. For more information, visit www.23five.org. Seattle’s Climax Golden Twins will present a live improvised performance using sounds derived from 78rpm records, cylinders, and the old players themselves. Through the use of modern techniques, they will recontexturalize century-old source material by mixing, abstracting, and processing it until some of it is no longer recognizable. 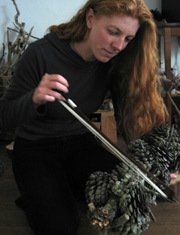 A collage video will accompany the sound performance. Climax Golden Twins are generally the duo of Robert Millis and Jeffery Taylor, though they are the first to acknowledge the numerous friends and collaborators that have made their work possible. Together and separately they have composed material for NPR, scored for film and television, curated compilations of Asian musics, created gallery and museum installations, and released LPs, CDs and DVDs on a variety of labels including Anomalous Records and Sublime Frequencies. Perhaps best known (if at all) for the score to the feature film Session Nine, their most recent full length CD is entitled Highly Bred and Sweetly Tempered, and they are working on a book and CD project with the Dust to Digital label. Called Victrola Favorites, it will be exactly that: selections from their collections of 78rpm records played on period machines. originally presented as part of In Resonance exhibition, Seattle, WA. Released on Conspiracy Records, Belgium. All sounds derived from 78rpm records and acetates. 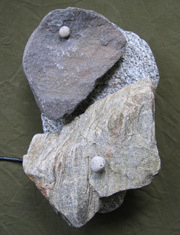 Three musicians play amplified water and a spectrum of rocks to evoke gestures and motions from the natural world. Compositions echo the mysterious racing rocks of Death Valley, ocean waves and eddies, rockfall on mountains, wobbling boulders, patterns of wind on grass, the sculpting of landscapes by glaciers, water flow through falls and rapids, and shifting tectonic plates.